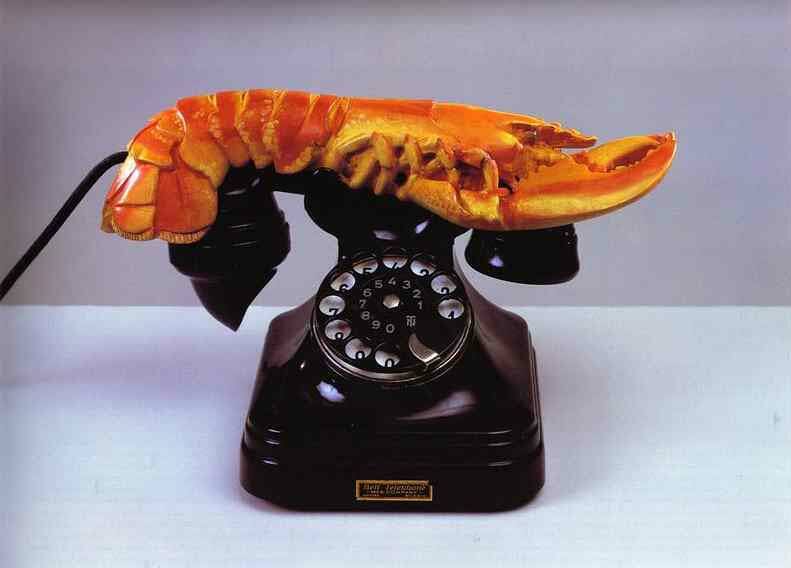 Lobster Telephone represents Salvador Dalí’s unique and quite humorous approach to art. The sculpture was created in 1936. It was made specifically for Edward James, an English poet and collector of Surrealist pieces. To explain the creation, Dali simply stated he could not understand why when ordering a grilled lobster in a restaurant he was never served a boiled phone in its stead. The telephone is an actual one and the lobster is made of plaster. Dali went on to create 5 additional versions of this work. One is currently being displayed at a communications museum in Frankfurt, Germany, one at London’s Tate Gallery, and another in Australias’ National Gallery. This art work shows a black telephone with a lobster resting atop its handset. Many have speculated on possible theories behind the piece. One could be the contrast of a prehistoric creature to modern technology. Remember in 1936 the phone was still considered “state of the art”. Another thought has its meaning as a statement of luxury with both a telephone (in 1936) and a lobster being representative of upper class living. The best explanation may because of Dali’s rather odd humor that he found this pairing to be simply amusing. That said, perhaps with this art piece also being known as The Aphrodisiac Telephone, there might have been more on his mind.